Diameter 18" 18" 20" 16" 12"
For some people a standard pedestal fan or tower fan is just not enough to keep them cool. However a home air conditioner will end up running the energy bill through the roof, but a happy medium would be a high velocity floor fan. 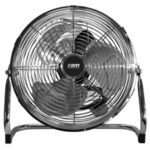 Having one of the best high velocity floor fans would be powerful enough to keep a large living room cool, without running up your energy bill. Even a powerful floor fan will have an energy rating on average of around 120W, whereas an air conditioner will be around 2000W. That’s more than 16 times more expensive to run! 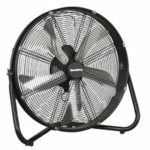 Industrial floor fans can typically be found in gyms, offices, warehouses and schools, because they are powerful enough for large spaces. 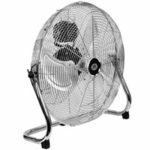 The top 5 best floor fans shown in our table all are suitable for home use, as they are smaller and less powerful than commercial floor fans. 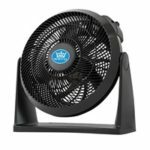 Since there are not as many features as an oscillating tower fan, choosing the best high velocity floor fan for your home should be a breeze! Here are some of the very few features to take into consideration. Speed settings – Adjust the speed settings according to how powerful you want the fan to be. Usually on the lowest setting it’ll still be quite powerful. 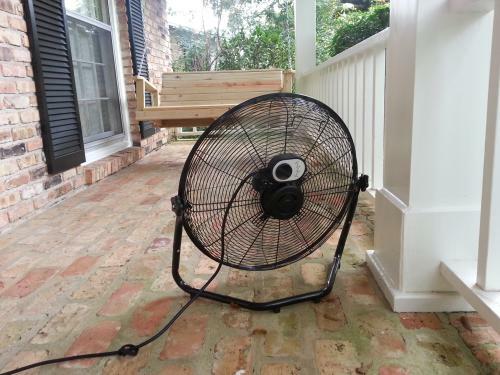 Diameter – The diameter of the floor fan will largely determine how powerful it will be. Larger fan blades will generate more wind and be able to cool down bigger rooms. Tilt – Tilt the angle according to the height at which you want the fan to blow at. Weight – Relatively light so easy to move around from one room to another. 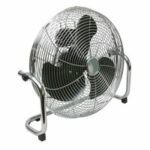 A tower fan seems to be a more popular choice, because most people wouldn’t really think to buy an industrial floor fan. The latter can actually be a more suitable choice depending on your circumstances. This is why we’re doing a comparison between the two, so you can decide for yourself. Suitable for the living room, garage, hallway, kitchen and larger rooms. Easier to adjust the angle to aim it higher. Not good for sleeping as it’s too powerful and noisy. Not safe to have around children as they can get their fingers caught. No timer or mode settings. Suitable for the living room, kitchen and bedroom. Different varieties of models to choose from. Options to choose models with a remote control, timer or mode. Can be used for sleeping as it’s quieter. Can only slightly adjust the height at which it blows wind out off. Not as powerful, so won’t be as effective in large rooms.